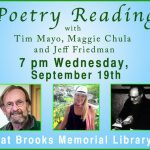 Join us on Wednesday, September 19th at 7 pm as poets Tim Mayo, Maggie Chula and Jeff Friedman offer a FREE reading of some of their recent work. Tim Mayo’s poems and reviews have appeared in Avatar Review, Barrow Street, The Brattleboro Reformer, Narrative Magazine, Poetry International, Poet Lore, River Styx, Salamander, San Pedro River Review, Tar River Poetry, Valparaiso Poetry Review, Verse Daily, Web Del Sol Review of Books, and The Writer’s Almanac. 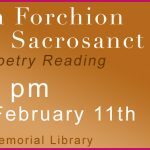 His poems have received six Pushcart Prize nominations as well as twice being chosen as a finalist for the Paumanok Prize.